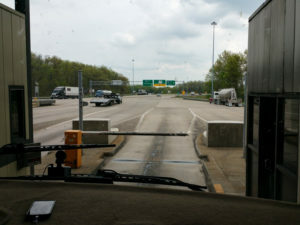 We drove on the PA and OH turnpikes at points along our journey from Washington DC to Michigan. That was quite an adventure. Even with an E-ZPass you are required to go through the tight toll booths. When you consider the wide mirrors on the RV, we can be wider than a semi. I held my breath as we squeaked past the toll booth with what seemed barely an inch to spare. At another point on the PA turnpike we came upon a 13’2″ high (or low, depending on your perception) bridge. We were going 60-65 mph. Now, our RV is just under 13′ tall so we were good with clearance, but it was a little nerving. After a somewhat high anxiety day of driving we arrived at Halliday’s Winery in Lake Milton, OH. This is another winery participating in the Harvest Host program (www.harvesthost.com). The winery was an easy, and short, drive off the freeway. It is housed in what was once a small church. They do not have a vineyard. However, the setting was nice as the building sits with Lake Milton on one side and a golf course on the other. The owner of the winery also owns the golf course. We arrived early in the afternoon, enjoyed a wine tasting and then headed over to the golf course to play 9 holes. After golf we had dinner in the coach and then attended a comedy show at the winery. It was very entertaining. We enjoyed a bottle of wine and snacks during the show. It was nice not worrying about how much wine we were drinking, as our ‘home’ was parked just outside the door. On our drive into DC, from Warrenton, VA, we stopped by the Air & Space Museum at Dulles Airport. It was my first time visiting and I was amazed by the number of aircraft on display in the hangar. We took the free 2-hour tour. It was very informative. I’d highly recommend it. Parking was very easy, as they have a huge lot for busses. We were able to pull right in and leave the vehicle attached. After our tour we headed over to the campground; Cherry Hill Park (https://www.cherryhillpark.com/). We chose Cherry Hill because it is the closest campground to Washington, DC and rated quite high. It is also close by to Charlie’s nieces, whom we planned on visiting. This was our first commercial campground experience. All previous stays were in US Army Corp of Engr campgrounds, a private motorcoach community or boondocking. The campsites were very close together, offering little privacy, but for being in a prime city location we expected that. The weather was dreary and cold all week so we never sat outside, and therefore, the proximity to our neighbor did not bother us. The campground offered transportation over to the metro, but we chose to drive ourselves so that we would not be constrained by the campground’s schedule. The campground has a very nice cafe, laundromat, pool, playground and game room. I can see why this would be a very popular campground for families. While Charlie and I have both been to Washington, DC numerous times, this was the first time that we were free to do as we pleased for an entire week. We toured the city during the day and then met up with friends and family for dinners. It was great spending quality time with so many people that we don’t often get a chance to see. On my previous trip to DC the Washington Monument was closed for reconstruction, to address some damage that had occurred during an earthquake. During this visit I was happy to find it open. Charlie and I got to the city early and were able to grab some tickets for a morning tour. The clouds rolled in right before our slotted tour time so the views were not spectacular, but they were still pretty good. In addition to the view I thoroughly enjoyed seeing all of the original stones which were used to build the monument. You get to see these on the elevator ride down. They slow the elevator down and turn on exterior lights. You can then catch glimpses of the stones through the glass door. I was able to snap pictures of a few of them. Another neat tour we took was of the Postal Museum. It is pretty interesting to learn the history of how mail delivery began, and how it evolved over time. In addition to touring the city, we visited Arlington National Cemetery. It was our first visit there. It was very sombering to see so many gravesites of those that have served in our military to protect our country’s freedom. We also visited the Naval Academy in Annapolis. We took our own personal tour of the grounds and then strolled through downtown Annapolis. We then headed across the bridge for lunch at ‘Boatyard Bar & Grill’. They were noted as having the best Crab Cakes. Charlie got those and was quite pleased. All-in-all we had a fantastic time in DC. There is so much to see. I look forward to returning. When I do return I plan on finding a way to get into the research area of the Library of Congress. I absolutely love that building. We left Galax, VA before 8:00am and headed to Thomas Jefferson’s homestead; Monticello. We were able to park the RV alongside the busses. We just had to unhook the Jeep and park it separately. We signed up for the house and garden tour. As an Engineer, I enjoyed seeing all of the technical things Jefferson invented and acquired throughout his lifetime. He was a brilliant man. The grounds and gardens were spectacular, as was the wine cellar. I believe they ate and drank well back in the day. Following the tour we got back on the road and drove to Warrenton, VA. This was our first night boondocking in a Walmart parking lot. The nice thing about this Walmart is that it is very close to the town of Warrenton where great restaurants, shops and quaint homes can be found. I actually wish we had more time to tour the shops, but we didn’t arrive until late evening. It was our 3 year anniversary so prior to arriving I searched Yelp for a good restaurant. ‘Claire’s at the Depot’ was highly rated, and for good reason. I had a Beet Goat Cheese Salad follow by a Rock Fish entree. Charlie had She-Crab soup followed by Veal Marsala. Of course we ordered a nice bottle of wine to go with dinner. The ambiance, service and food were all spectacular! In the morning we took the toad vehicle and drove down the street to the Red Truck Bakery. As a side note, my daughter had just stopped by the Red Truck Bakery in Marshall, VA and couldn’t say enough good things about it. Even President Obama had been to this bakery and raved about it. She said we had to make a stop by the bakery on our way to DC. We had every intention of doing that until last night, when on our way back from Claire’s we saw that there was a Red Truck Bakery right in Warrenton! We were so excited. We purchased a loaf of Banana Bread and a couple of muffins. We didn’t eat the banana bread until later and when we did I strongly regretted having not purchased all I possibly could have and freezing them. I mean seriously, we had never had bread so moist and flavorful! I’m going to find a way to get back to this bakery! 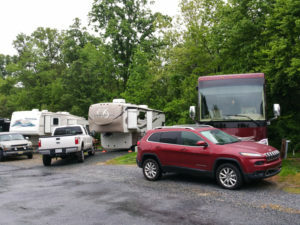 Deer Creek is a Class A Motorcoach lot ownership community located in the Blue Ridge Mountain region. It is a very nice resort and the owners were very welcoming. We had met one of the couples, Mary Anne and Mike, previously at a Tiffin Rally. They were kind enough to invite us up for a few nights, at no cost. It gave us an opportunity to explore the area and to see what a Class A Motorcoach ownership community was like. We arrived on a dreary, overcast day. Mt. Airy, NC is not far from the resort. This is the city where Andy Griffith is from, and the city he re-invents in his show, as Mayberry. The city has a lot of memorabilia, and we enjoyed taking a trip back in time. We had breakfast at ‘Snappy’s Lunch’. This is the only business referenced in the Andy Griffith show by name. They are known for their pork chop sandwiches. We didn’t get to try those though, as it was too early when we arrived. Snappy’s does not appear to have any glassware, as beverages are served in styrofoam and food is wrapped up as if it was ordered to go. I imagine this is how things were 50 years ago. We enjoyed the food, as well as the experience. We toured the Andy Griffith Museum, which was very enlightening for me. I hadn’t realized how much Andy Griffith had accomplished in his lifetime until I took the tour. While strolling around town we found the Mayberry Courthouse and Wally’s Service Station. Both brought back fond memories of the TV show. For a fee you can take a ride in the police car. Just outside of Mt. Airy is Pilot Mountain State Park. We stopped by there for a little sight seeing. Charlie wasn’t feeling very well so we parked in the upper lot and took a short hike to the peak. The views were spectacular. The weather was better than expected during our 3 day visit. Per the forecast, we expected lots of rain. We ended up with 70-80 degree temps and overcast skies during the day with rain at night. Perfect! If you are ever in the area I highly suggest you check out Deer Creek. They offer 3 nights for free.